Allows for use of home-brew and all the neat apps. Great add-on for your PSP. Store music, movies, pictures, game saves and more. This is a great item that can be used for a number of things. You can back up your movies, games and music. By backing up your games to memory card, you can reduce the lengthy load times that the PSP is infamous for. These cards allow for a quick data transfer rate in conjunction with a USB adapter cable. All the options provide appeal to just about anyone. There are plenty of online forums to explain how to maximize the combined use of your memory card and PSP. 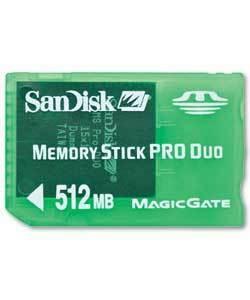 While many people may opt for the larger 1 gig or 2 gig memory card, 512MB is plenty enough for the budget gamer. The 512MB can provide hours of music, hundreds of game saves, or perhaps a movie or a wide variety of home-brew applications. The number of games will depend on the size of each. There are plenty of games which only take 75 - 200 MB, such as: Bust-A-Move, Dead to Rights, Astonishia Story, and many others. There are also games as large as 1.8 gigs. In this case you would only be able to fit one game on a 2 gig memory card. If you own a PSP, a decent sized memory card is a must.